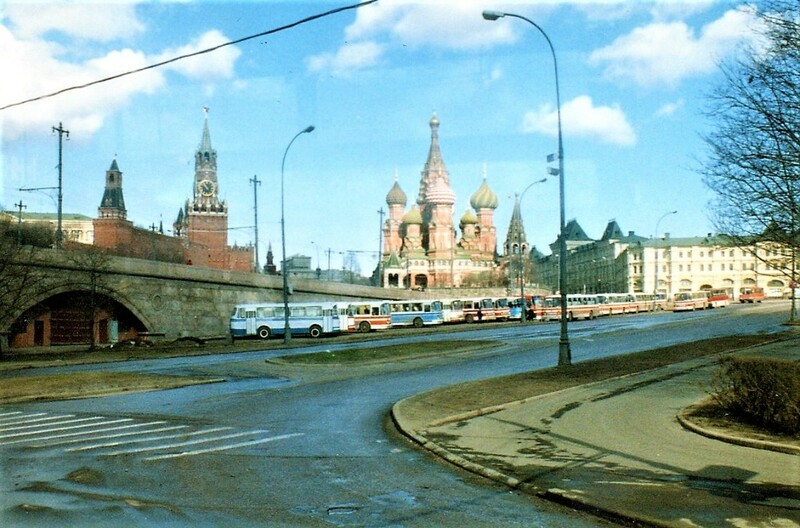 The first trip I decided to take was to Cold War Russia. And, as I search my ‘way back’ memory, I’m not entirely sure why I wanted to go there. Perhaps it was because I was 18-years-old and absolutely gagging for an experience that would blow my socks off. Deeper than that, I have always, since my earliest memories, desired to go where people don’t usually go. Our family never had money for extras, especially not Transatlantic trips behind the Iron Curtain, but my Grandpa had given all of his grandchildren the gift of $3000 one Christmas. It was a phenomenal amount of money. I think my brother’s portion hit his bank account for eight minutes before he bought a truck. I sat on mine for a year, and then the opportunity to do something entirely unexpected presented itself. It was 1988. Russia was technically the USSR, Gorbachev was leader and tossing around terms such as perestroika (restructuring) and glasnost (openness), and it was probably because of this that there was a softening of the borders. Yet, there was still a suspicion of outsiders. My hotel had microphones in the ceiling and people followed me wherever I went; definitely an overwhelming feeling of being watched. The thought of going to the Soviet Union was insane. Aeroflot planes had crashed and been hijacked, the Soviets were sitting on the ‘bomb’, it was a highly militarized state, there were no cell phones or internet to keep in touch back home and the KGB was actively monitoring public and private opinion. There was a general fear that at any moment the Soviets were going to attack and that pressing ‘the button’ would end all humanity on the planet. I had been raised with school drills that had us shutting the windows and cowering under our desks…as if that would save us. Perhaps I wanted to slay the dragon, look it straight in the eye and see if it was real? So, my ‘grandpa-money’ bought a ticket to the USSR. 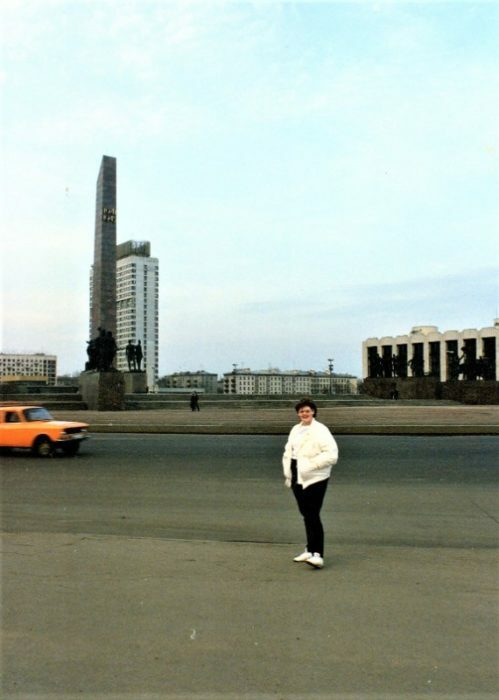 Carla, at 18 years old, in front of the Victory Monument. I kept a journal while I was there and I dug it out to see what I was thinking 30 years ago. I wrote about everything, from the altitude the plane was flying at, to the names of the Black Market hucksters that latched on to me at every opportunity. Let’s check in with 18-year-old Carla’s view of the Soviet Union, shall we? I laughed out loud when I read this. I didn’t see myself as a ‘tourist’. And I thought, what is a ‘tourist’, to me? There is an age-old debate on what constitutes a tourist versus a traveller, and I have always thought of myself as the latter. I believe that there is one key difference. Travellers do not demand that the place they are visiting change and morph to their own comforts and standards. I was once staying a guest house in the Middle East when a travel group booked in. It was a cold night and the group was complaining incessantly about how cold they were, even with the exceptional measures that the staff had taken to make them comfortable. One of the villagers came in carrying blankets that he had taken off his own beds at home. The moment that this group decided that they should be warmer and more comfortable than the people who actually lived there, is the moment they went from traveller to tourist. And that is what I was feeling in the Soviet Union. At the time, ‘American’ products meant freedom and so I could get just about anything on the Black Market by trading a pair of blue jeans or high-top running shoes. The locals were also nuts for chewing gum and makeup. Pepsi kiosks were in the park with people lined up to enjoy a warm, flat, dixie cup-sized shot of the American beverage. I didn’t like seeing this. It felt intrusive and anachronistic. And, even though it is an oversimplified way of looking at things; I felt the more ‘American’ it got, the less ‘Russian’ it would be. I think we have all been somewhere that we can categorically say ‘the tourists broke this place’. It puts me in a mild panic, that soon, the world will be awash with similarities and that the wonderful things that make us different and special will be diluted and lost. It doesn’t have to happen though, we have the power to leave a softer imprint on the world we seek to know. I have friends that travel down to Cuba with suitcases loaded full of presents for kids. This want to have a feel-good, do-good interaction with the locals has the opposite effect in so many ways. You can give that one kid a Superman lunchbox and feel good about it. But then he’s going to take it to his house and his brothers, sisters, friends, neighbours, etc are all going to ask where he got it and want one too. And so, begging is born. But, before you showed up, he didn’t know that Superman lunchboxes existed, or that he should even want one. All of us who travel may willingly, or unwillingly, create a culture of want wherever we go – and in my opinion, that’s not a good legacy to leave behind. 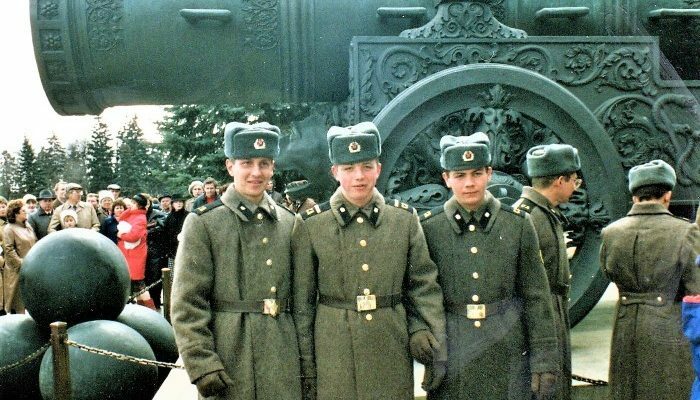 Soldiers in front of Tsar Cannon, built in 1586 – Moscow. Even at 18, I knew that trading my blue jeans on the Black Market would do more harm than good, even though I couldn’t articulate why at the time. 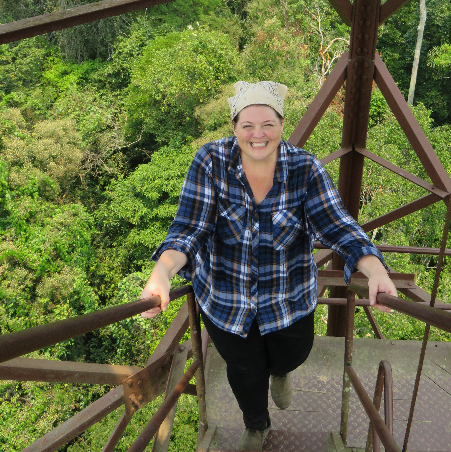 I felt that I had to leave no trace, to just be an observer and learn and understand the culture I was in, without changing it for future travellers. I think that this is the conundrum that so many tour operators find themselves in; how do we bring people to a special place, without those very people irrevocably changing it? Of course, general progress in the world changes cultures. The Russia I wandered around in 1988 is not at all the Russia of 2018. Advancements in technology have changed the way we travel in immeasurable ways. If I needed to make a call out of the USSR in 1988 it would have been, a) difficult, b) take 15 minutes to connect as it bounced through 10 operators, and c) cost a gazillion dollars. Now I could do a Facebook live video with the entire planet straight from Lenin’s tomb. Is that a good thing, or a bad thing? I might go out on a limb here, and face getting labelled as a Luddite, but, I’m kinda on team-it’s-a-bad-thing. But let me tell you why. 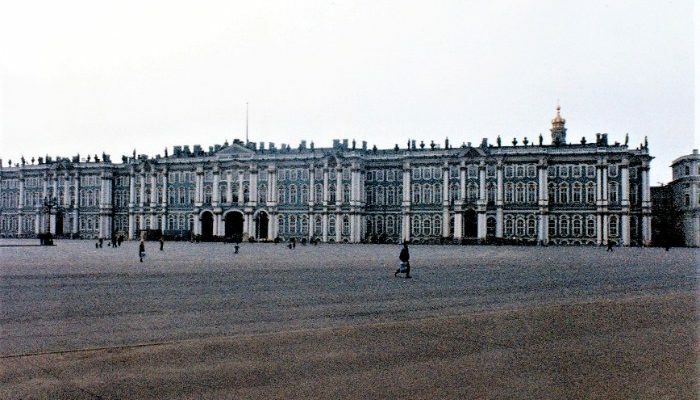 The Winter Palace, before the flocks of tourists you find nowadays. We are forgetting how to be ‘away’. For me, being connected 24/7 to my world back home does not allow me to submerge myself in the place I’m visiting. To just let go and stay there, in the culture, uninterrupted, for a great length of time, without the need to Instagram it. When I was in the Soviet Union, I couldn’t count on Google Maps to get me back to my hotel. I had to get out of my comfort zone and interact with the locals. And those interactions, everywhere I have travelled, have led to the most memorable experiences. That’s why I’m travelling, isn’t it? I’m not going places to spend time with my phone. I’m also not going to spend time eating at McDonald’s, standing at Pepsi kiosks or lying around on a resort that does everything in its power to make sure I have no idea what country I’m actually in. The flop and drop is a huge market though, and I understand completely why countries pander to the demands of the travelling hordes. But, I think there is a growing market of travellers, myself included, that wants to travel as close to the bone as they can, and experience places authentically. My only hope is that when people decide that they value culture over comfort, that there will still be a culture left to visit. Travel has gotten so much more accessible and cheaper as the years have passed. People are able to hop on planes and travel to most corners of the world without too many issues. The world is becoming a smaller place. When I travel, I feel like I’m just going to visit neighbours, and chances are, someone in my town is just returning from where I’m about to go! It’s because of this accessibility that I worry about the future of ‘culture’. And so, it is imperative that we tread lightly when on someone else’s turf. It is absolutely essential that we honour the culture that presents itself to us, wherever we are, no matter what our opinions of it. And when we come home, back to our comforts and our norms, we can regale our friends and family with stories of diversity and adventure. That is the gift I received from the Soviet Union and it has stayed with me for the past 30 years. It whispered to me as I walked the halls of the Winter Palace, “This is who I am.” It pulled me into its embrace when I met with some Young Pioneers and said, “This is what I’m about.” It joked with me as I scraped snails out of the shower, “I’m different from you!” It fed me horse meat, tongue and perogies. It dazzled me with opulence. Disturbed me with history. Impressed me with Georgian dance. Excited me with circuses. It made me think. It made me wonder. It made me want to know more. It made me a better person. And, isn’t that what travel is about? Do you want to get away from the crowds and be a traveller, not a tourist? Book your spot on one of Peregrine’s small group tours and discover a range of destinations off the well-worn tourist paths.